» Inky Antics’ Action Wobbles Hop! Inky Antics’ Action Wobbles Hop! You see, we’re here to share Inky’s Action Wobbles with you today … and I have a feeling you’re going to think of lots of ways to wobble on some of your own upcoming creations. Come see! Action Wobbles can be applied to the back of so many cute images. They’re sold in packages of 12, so you can create fun birthday cards and goodness knows what else you’ll come up with! I’ve used Inky’s Bumblebee HoneyPOP clear set on my card today, but the rest of the Inky team has come up with even more ways to create with this delightful addition to our projects. >>>> HOP DETAILS: The blog hop starts today and ends on Sunday, May 27th at midnight Central time. Please visit each DT members’ blog to view their projects and leave a comment for each designer. The more you comment, the better your chances are to win. (Limit one comment per blog, please). THREE people’s names will be drawn at random to receive a pack of Action Wobbles and an Inky clear stamp set. The winners’ names will be announced on the Inky Antics blog next Monday, so remember to stop back and see if you’ve won. Thanks oh so much for stopping by & hopping along with us! Your “wobble” card is delightful! 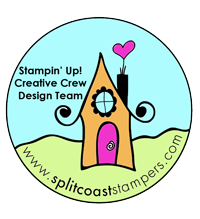 The stamps are already cute but adding the wobble touch just gives them something really special and a lot of pizzazz! Love it! Adorable Tex! Love the shape of the card. How smart were you to wobble bothe the image and the sentiment! Love your card. The bee is adorable! Nice choice of colors to go along with it. Oooh, Tex, I love this card! Fun shape, beautiful coloring…and the double wobbles is a brilliant touch. Thanks for your great photos and write-up, too! I like that bee stamp set. It’s a good one and fun to see bee and saying with wobble. Darling! I love the hexagon shaped card! How very cute, love the Wobbles, think I am going to have to get some. TFS. Oh a double wobble! Aren’t you clever! Great job…TFS! Tex, from one Grammy to another, this is AWESOME! My grands will love these wobble cards as much as I do! Beautiful job and thanks for the visuals! Love ’em! What a unique shaped card! Cute and I love the bee! Love the shape of your card! Great colors and a clever idea, using 2 wobbles! I love the shape of your card and the cute image you used. How fun to have the sentiment wobble also, 2 x the fun. Sweet honey bee card. love the wobble thanks for sharing how it should look from the side. your card shape is clever too. 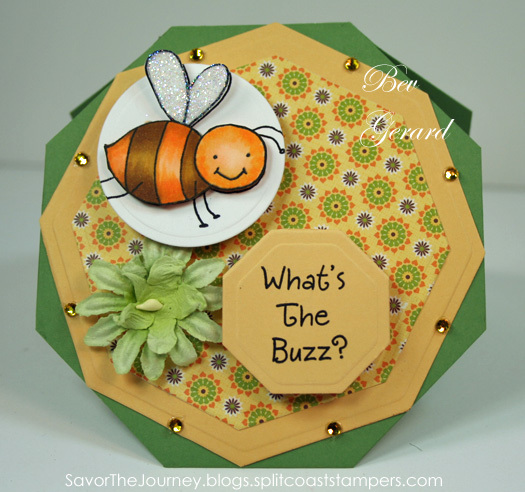 Love the use of the card shape to accent the bee theme. Love the bee and the great colors on this FAB shaped card. Hahaha! This is too adorable for words! AWWWW Tex this is ADORABLE!!!! LOVE LOVE this whole design sweetie!!! The shape and the colors are soooo fun, GREAT card!!! Ooooh, Bev…your little bee is adorable and I loooove the action wobbles….I need me some of those!!!!! very cute and twice the fun with two wobbles! This is so adorable Bev. I need to get me some of those wobbles. A uniquely shaped card. It is darling w it’s double wobble! Very fun card–I am a beekeeper so I like the images you chose to wobble! Thanks for sharing the card. I love the shape and the wobbles make it more fun. I’m glad I don’t have to pick a winner because they’re all so cute! I’m new at this and I’m getting so many good ideas! I Love the way you put together the 3 (or 4?) shapes. Good job! I love the shape of your card and the repeat of it on the card. love everything about it and those wobbles give it an extra something! HUGS! What a cute idea!!! Love the wobbles. That is a “honey” of a card! Just love the wobbles! Oh my gosh! Fun card Bev! Love the shape and all that wobble! Love your accent too!! :) Have a fab day gf! The action wobbles are darling! The bee is cute, too! Thanks for sharing!